Today marks the beginning of the second decade of Hoperatives. We can’t swear to it, but this may well be be the last new blog post that ever appears here. If it is, it’s a little bit of symmetry we never could have predicted at the beginning. We had no idea what Hoperatives was going to be when we started, and the world is quite a bit different than it was in 2009. But we’re still here. And, apparently, so are you. This may be the last “official” blog post, but Hoperatives is not going away. It’s being rebuilt from the ground up. Literally. We’re moving off of WordPress and going to a custom piece of software that will do what we need it to do and nothing else. For those of you who care about such things, that’s not an editorial comment on WordPress. It’s a great blogging platform and it has a bright future. It’s just not what we need. What we need doesn’t really exist, so we’re making it ourselves. Which is how we started in the first place. Stealing from our dear friends at MadTree, we’re going to say Hoperatives 1.0 is going away and Hoperatives 2.0 is coming. When? When it’s ready. Not before. It’ll be this year. It’s kind of like opening a brewery. Announcing a date is just a good way to make sure it doesn’t happen by that date. So this isn’t an ending, it’s the beginning of something new. That’s what New Year’s Day is all about. That’s what birthdays are about. Hoperatives has a future. That’s the tl:dr. You can stop here if you like, though we hope we’ve piqued your interest and you want to know more. This is a long read. That happens when you only post twice in a year. If you go back to the post where we announced we we going on hiatus you’ll see a somewhat hand-waving reference to an idea we were thinking about. We also referenced the fact that the last couple of years have been, let’s say, a little busy for us. Health stuff. Work stuff. Family stuff. The trifecta, really. About six months ago we hit a decision point where we had to either move forward with the idea or not, and we decided to move forward. It’s been a slow process because all that other stuff has still been going on, but it’s all moving in the right direction. We’ve reached the point where we can talk about things in a little more detail. For it to make sense, a quick (we promise) visit to our history is necessary. Hoperatives turns 10 on January 1. This is the 2,253rd post. It goes without saying that the world was quite different in 2009. We still had BarrelHouse Brewing then. Mt Carmel was about a month away from starting to package in something other than growlers. Boston Beer Company had just completed its purchase of the Hudepohl-Schoenling brewery plant. The first test post we put up was about a Little Kings ice bar down at the ice rink on Fountain Square. It was there to promote the fact that Christian Moerlein had purchased the brand and finally put it back under the control of a Cincinnati-based company. It would be several years before Moerlein was able to brew here again, but we started right around the same time they’d started the journey back. Speaking of Fountain Square, Rock Bottom was getting ready to survive years of renovations of both the fountain and the Square. They embodied the tenacity it took to be into beer in Cincinnati in those days. We had no idea what we were getting into when we started Hoperatives. We thought we did, but we didn’t. It was right around this time of year we really committed to the idea of doing a beer blog. We didn’t have a name. We didn’t really know what we wanted to do with it, except we wanted it to be a place where people could go to find out what was happening in the beer scene in town. There was a vibrant and active beer scene in town, but you had to look for it. That was a big part of why we started this. We were finding out more and more about what was going on in town, and this was height of the Great Social Media Outbreak of 2007-2010. Starting a blog is What One Did. So we started a blog. The one thing we knew we wanted to do was be a clearinghouse for information about beer events in town. For the most part that meant tastings at retailers and beer dinners at Rock Bottom and a few other restaurants like Dilly Deli (as it was called then), Teller’s and Arnold’s. That was pretty much it. We were meeting a lot of people and we asked some of them to write things for us, and they were kind enough to do it for nothing more than occasional swag and the experience of doing it. We tried all kinds of things. We hosted events called “Hoperatives Happenings” that were a lot of fun, but an awful lot of work to put on. We even ran a blogging conference for a couple of years. We’re glad we did it. We’d never, ever want to do it again. We did whatever we could to fill in the gaps between our weekly “This Week in Beer” post that came out (most) Mondays and “Tastings and Tappings” that came out, oh let’s say, late in the week. It varied. It’s not news to anyone that the beer scene exploded in Cincinnati in the time since we started. We were privileged to have a ringside seat for it. It has been amazing. The word ‘privilege’ is not chosen lightly. It’s been something to see. Other blogs came along and have had their own trajectories over that time. Some have moved up. Some have moved on. Some are still at it. The scene is so much more complex than it was. That’s not unique to Cincinnati. It’s true of a lot of places. Something else that we’ve been lucky enough to do is get to know people at all levels of the beer scene all over the U.S. and even beyond. There’s an ongoing global conversation that’s never really ended, even while Hoperatives has been on hold. What’s funny is that in the metrics used to measure how well we performed as a blog, we were actually pretty much miserable failures. A couple thousand people looked at the site in a good week at its height, but no one stuck around very long on any single visit. We weren’t “sticky,” and all the cool kids called said you had to be sticky to be a “real” blog. That was fine. We liked seeing that people found us useful every week. We had long ago accepted that, in our world, ‘cool’ was just the temperature we preferred our beer. We liked the fact that people who wanted to know something could come in, find what they needed, then go on with their lives. That was a win in our book. There even came a point we quit referring to ourselves as a “blog” and started referring to it as an “informational website.” Carla spent uncountable hours scouring Facebook, Twitter and websites looking for events to feature in our “tentpole” weekly posts. We occasionally would be asked how a place could get their information listed, and we said “send us an email.” Some did. But not enough did to fill out “This Week in Beer” and the “Tastings and Tappings” post. There came a time that the two weekly posts were pretty much all there was on Hoperatives, but it was still a very labor-intensive process to get them done. As health, work, and family issues took more and more time, even they became too much of a commitment. Late last September we announced the hiatus. There has been one post on the site since then. We’ve maintained our Facebook presence and, by extension, our Twitter presence, but that’s it. That’s where we’ve been and where we are now. So what’s this big idea? It’s not a big idea, really. It’s a simple idea with a lot of moving parts. In a nutshell, we want to take Hoperatives back to its ultimate roots as a clearinghouse for beer events in the greater Cincinnati area. We want to be a reliable, low-risk, low-noise, and easy-to-use resource for information about beer-focused events in Cincinnati. If you like going to events that feature beer, we want to be where you go to find out about them. If you put on events that feature beer, we want to give you a place to tell people who are interested in them about yours. And we want to do it in such a way that it doesn’t take every waking moment of our lives to make that happen. That’s what Hoperatives is going to be. It’s going to be a events calendar that’s easy to use and useful in a number of different ways. The main place it will be meant to be useful is on your phone. You’ll be able to use on other devices, but it’s going to be a mobile-first web-based application. A “progressive web app” if that means anything to you. Don’t worry if it doesn’t. What about all that stuff about being reliable, low-risk, low-noise, and easy-to-use? Those sound suspiciously like buzzwords, and buzzwords are evil. They do have particular meanings as they’re being used here, but we promise we’ll never say them around you again. We don’t want to ruin them. The 900-lb gorilla of promoting local events is Facebook. You’ll notice there’s no link to them because, come on, you know what Facebook is. You may or may not come across this post via Facebook. And that’s the point, really: “May or may not.” At one time Facebook was a pretty good way to promote events on the cheap. At one time. At one time being a buggy-whip manufacturer was a pretty good way to make a living, but I wouldn’t recommend it today if you’re into making good life choices. You can effectively get the word out to people about your event on Facebook in direct proportion to the amount of money you want to pay Facebook to ensure people see it. Pay Facebook enough money and you can show up unsolicited in someone’s feed right after the Amazon ad telling them about the great deal on a thermostat for a a dryer they’ve never owned. In theory you can learn a lot about who these people are and what their hopes, dreams, and desires are. Of course they know that so they lie whenever possible, and you’re really not that interested in their hopes dreams and desires, anyway. You’re hoping they’re free next Thursday. So how is Hoperatives going to be different? Well, for one thing you’ll be talking about your event on a website read by people who want to read a website about events that feature beer, not an endless progression of Fifty Ways You’re Doing it Wrong. And it’s not going to cost you — or them — anything. Souls or self-respect included. We’ll be able to tell you how many people you’d be talking to. We’ll occasionally run surveys of readers to find out some demographic information. We won’t collect names. We won’t collect browsing histories. We’ll know very little about anyone’s hopes, dreams, and desires. Truth be told, we’re not going to know who’s free next Thursday, either. If that’s a problem, you’re more than welcome to send money to Facebook. They won’t know either, but they’re always happy to have the money. If you’re a reader, we’re really and truly not going to know anything more about you than you want to tell us. And we don’t really want to know that much about you. Anything we ask you will be opt-in, not opt-out. The only advantage of even registering for an account is that some features will continue to work without a reliable network connection on your phone. You’ll always be able to use the site anonymously without having to log into anything as long as you have a good signal on your phone. If you specifically tell us you want to sync your settings among multiple mobile devices, you’ll be able to do that, but we’ll have to save a little more information on our end. We’ll tell you exactly what we do and don’t save on our end. It’s not much, but you’ll know what that is and be able to delete it forever whenever you like. And you’ll never be required to do tell us anything about yourself to use the site. We’d say the same about people who post events, but it’s tough to promote events if you don’t know who’s putting them on. We can promise, however, that you’ll have control over what’s public and what’s not. The idea here is for you to come to Hoperatives when you want to find events that focus on beer in your area, whatever “your area” means to you at a particular time. That can change from minute to minute. You shouldn’t have to put up with scrolling through a bunch of events you’ll never care about in order to find a few you might be interested in. You shouldn’t have to jump around to multiple sites or Facebook pages in order to find events you’re interested in. Maybe you’re interested in events next week because you know you have a couple open evenings and anywhere on your side of town could work. Or maybe it’s been a lousy day and you want to find something within 20 minutes from your home. We want Hoperatives to be where you turn. 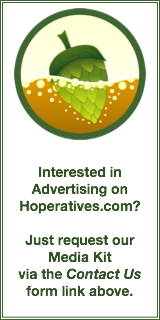 The idea is also that you come to Hoperatives if you are putting on an event that focuses on beer and want to list it as an option for a particular place and time. People plan ahead. People are spontaneous. Do you schedule your post about your event on your website or Facebook a week out? The day before? Will people still be able to find it the day before? Will they see it at all? With Hoperatives you’ll submit your event. It’ll list the same day and it’ll be there for people to discover any number of ways. So what’s it mean when we say that we’re a place to list beer-focused events? An event is beer-focused if beer is a main point of the event. No beer, no event. A beer dinner? That’s an event that focuses on beer in a particular context. There are other kinds of beer pairing events that would also be appropriate. A tap takeover? Yes, but only if a significant number of your available taps are being taken over and someone representing the beers are available for people who attend to speak with. A flight night? Sure, if it’s something out of the ordinary. It needs to be an event, not a menu item. It’s not an event if it’s not possible to miss it. It can be a free or paid event, but it needs to something that makes no sense if the beer were removed from it. A happy hour is not a beer-focused event, even if beer is the only thing being discounted. The mere opportunity to buy beer by itself doesn’t make something a beer-focused event. We aren’t going to get too hung up on definitions. Ultimately we’ll make the call as to whether we’ll list something or not. If you submit an event and we have questions. we’ll ask. What it boils down to is it’s not a beer-focused event if it would be possible to have the event without the beer. Family nights, whether there’s face-painting or not, are not beer-focused events. Even if there’s beer there. Hoperatives: Come for the beer-focused event listings. Stay for the beer-focused event listings. Then leave the house and go to one. Do you have tons of free time? Neither do we. No one does. Hoperatives is going to be built with that assumption at its core. We want it to be fast and simple to discover events. We want to make it fast and easy to let us know what events you’re holding. It will be possible to accomplish anything you need to using your phone. You won’t have to use your phone. Everything will work on a tablet or larger device, but phones are going to be first-class citizens. You’re not going to have to download anything. Any current web browser will be enough, unless that current browser is Opera Mini. If that’s what you’re using on your phone you’re already used to disappointment. Hoperatives is going to be useful to you without you paying us any money at all. There aren’t any plans (or desire) to charge anyone for the primary functionality of the site, which is listing events for interested people to see. The ability to connect people who want to go to beer-focused events to people putting on beer-focus events has always been what we’re about. It’s why we’re hanging around. It’s what we want to do. If we didn’t find it to be a good thing all by itself, we’d just shut it all down and be done with it. We’re perfectly willing to make the site useful for you for that without charging you for it. Not every good thing needs to have a price tag put on it. Don’t get us wrong: We’re not opposed to people giving us money. Truth be told, we’re really rather fans of the idea. It will be possible to buy a very limited number of sponsorships that will appear within the site content. They will be visible without making the site unusable and are meant for beer-related businesses that might not hold events that meet the normal criteria. There will also be a limited number of slots for featured events. These will be clearly marked as such and will possibly include a modest amount of information beyond what the standard free listing will include. This is still a work-in-progress because we’re not interested in crippling the effectiveness of free listings in order to make featured ones more attractive. Part of what’s going to make a featured event “featured” is that there aren’t going to be too many of them. Sponsorships and promoted events will only have value if prominent placement has value over and above a standard listing. THAT can only happen if the standard listing is really useful for people who want to attend events and those who put them on. Some people paying us to get more prominent visibility would be very nice. It’s not the main measure of success. The main measure will always be the number of people who use the site. Everything will come from that. Hoperatives has always a self-hosted WordPress site and it will continue to be. WordPress has also changed a lot in the last 10 years, and it’s perfectly capable of doing what we need it to do. There’s some work to do under the hood to take our site from where it’s been to where it’s going. It’s not going to happen all at once. The plan is to be done with the transition by January 1, the official 10th anniversary. We’ll certainly do something on that day as a big symbolic gesture, but the idea is that we’ll be fully open for business in our new form by then. It’s not going to be a deal where we flip a switch and everything looks different. This is going to be a work-in-progress for the next four months. New features will roll out as they’re ready to be seen. We will probably do something a little special on January 1 because you only turn 10 once. Of course you only turn any age once, but there’s something about the one that end in zeroes. The years of stuff in our database is a small part of the historical record of beer in Cincinnati. It will be maintained as such, and there will always be a way to search it if you have a reason to. A Monday “This Week in Beer” will return, though the content will be automatically generated from listed events. An end-of-the-week weekend planning post is also a possibility. We’re going to put a lot of effort into making the event-posting process as easy and as fast as we possibly can. If you represent a brewery, retail establishment, bar, restaurant, or brewpub that hosts beer-focused events, we’re very interested in working with you to make sure we meet your needs. If you’re interested in possibly participating in the early stages of this, please reach out to us via our “Contact Us” form. The number of folks we’ll be able to work with early on will be extremely limited. If you are a Hoperatives reader, you’ll see new things appear at various times over the next few months. You won’t have to do anything special. Let us know if what you see meets your needs and whether or not it worked the way you expected. If there’s something you want to see, this is a great time to let us know. The one thing we can promise is that there will be no more 3000 word epics like this. But we’ll still be here. Promise. Our friends know that it has been a crazy summer for us. So crazy that letting you know about this important project in need of funding slipped by us. When Carla started researching the possibility of creating a brewing science program at Cincinnati State by visiting other schools, each place she visited mentioned the history of brewing in Cincinnati and how teaching brewing here now just made sense. The OTR Brewery District is instrumental in preserving that history and the Brewing Heritage Trail will strengthen that important work. Please take a moment to check out their Indiegogo campaign. There are lots of great incentives for donating. Even if you just have one less pint of beer this weekend, your $5 donation acknowledges that you support preserving Cincinnati’s brewing history.